The Blazers amassed 5,912 of total offense, most in the Gulf South Conference. Scoring usually leads to wins. Now it leads to history. This Saturday, the Blazers will play Lenoir-Rhyne in the NCAA Quarterfinals. If the Blazers score 30 points, they will become the highest scoring team in Gulf South Conference football history. That’s a small “if,” as the Blazers have built a season long resume that could ensure that making history won’t be far of a reach. The Blazers average 54 points per game and have dominated the scoreboard all season. In their last matchup, VSU posted 66 points on Bowie State, their highest scoring total of the year. It was in the playoffs. The last time the Blazers scored less than 30 points was over a year ago, as VSU hosted West Alabama for homecoming, losing 38-14. It has been a turnaround year and the train that they are riding, doesn’t seem to be slowing down anytime soon. Head Coach Kerwin Bell is no stranger to scoring points, especially with the right talent. Bell’s starting quarterback, Rogan Wells, took home the GSC Offensive Player of the year award with 40 touchdowns and four interceptions. Wells is one of nine finalist for the Harlon Hill award, also known as the Division II Heisman trophy. 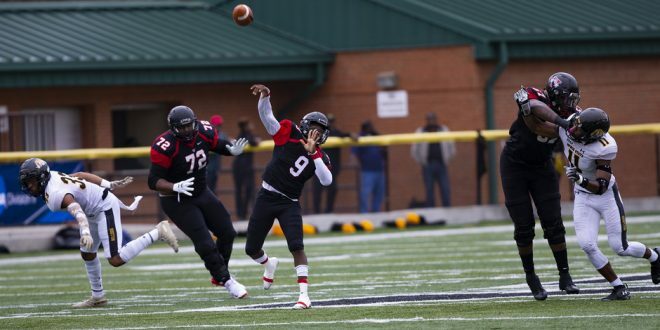 Through the air, the Blazers are phenomenal with either of their quarterbacks under center. Adam Robles, last year’s starter, has seen a few possessions of play. He has three touchdowns on the year. Ivory Durham has come into his own as of late, as Bell has used him in a variety of packages to display his athletic gifts. The freshman signal caller has amassed 14 total touchdowns on the season; seven on passing and seven rushing. Also, Bell has weapons on the outside with All-GSC first team selection Lio’undre Gallimore, second team selection Brian Saunds, and Kenny Benjamin. The trio combines for 1,060 receiving yards and 21 touchdowns. The only way they will be kept from eclipsing 30 points, is if the Bears get in the face of any of VSU’s quarterbacks. No team has found a consistent way of doing that this season. There have been 13 sacks against the Blazers all season, third most in the GSC. Three of VSU’s offensive lineman are recognized as All-GSC first teamers, LaVonne Gauthney, Adonis Sealey, and Jeremy King. They make up the most of any offensive-lineman selections for the first team of any school. With Wells protected and surrounded by explosive talent, 30 points could come fairly easy.